Here's the chair before...a little thread bare and worn through in a few spots. My client got this great heavy weight chenille type fabric from Joanns, during their 50% off sale last month. Arms were worn through...but the chair was a great scale and super comfy and a nice size for the kids. Here is the amazing after....I FELL IN LOVE with this chair. Look how amazing that fabric is on that shape of chair. I am not gonna lie...it took some thought to make all those wavy lines line up. I chose a stripe (orange/red) that I wanted to center, stuck pins in my chair down the center on the original fabric. Then when cutting out the cushions I centered the same stripe. Close up of front of arm. I ran piping along the seam where the back connected to the inside arm. Another after. Sorry it's a little blury I am getting used to my new 50 mm. lens. My client chose an orange chunky weave fabric for the ottoman and we did box pleats all the way around. LOVE IT!!! I also did another chair for her out of brown fabric with small turquoise chenille dots on the fabric. All my pics turned out really bad, the lighting in the basement didn't work out so well. I still wanted to show the fabrics together, I loved the eclectic non matchy fabrics together. Here is a close up of the turquoise dot fabric. Her kids were super excited about the new furniture and helped haul everything in from the trailer for me....and called dibs on their new favorite spots. I took my boys to Lamb Day in Fountain Green last weekend...Another parade with candy! My boys were ready with their bags. We hung out with Heber's side of the family for the parade and had lunch. Heber and all his cousins used to be the ones in the road with their bags, now it's all the grandkids. That chair and ottoman look incredible, I want both! Wow! I love the fabric on the chair--and I can't believe you got it all to line up! The ottoman is so fun, too . . . what a great set! Great job! Wish I lived closer to you! That looks great!!! I am visiting from Tatertots and Jello and I am a new follower! 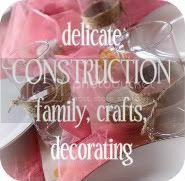 I would love if you would come link this up to my Delicately Constructed linky party! !